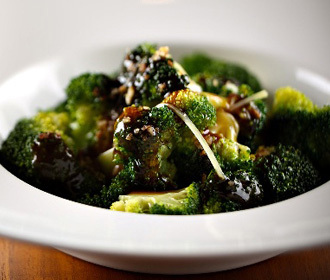 Steamed broccoli in our special oyster sauce. Fresh green broccoli crowns Stir-fried on a blazing Extra large stationary Wok reaching upwards of 500°F along with fresh diced carrots in a rich chicken based broth with fresh grounded garlic, and premium Chinese sauces, for a rich thick brown oyster based sauce. Served with a small cup of gourmet Steamed premium Jasmine Rice.